PANAMA CITY BEACH, Fla., March 6, 2012 – The Panama City Beach Convention & Visitors Bureau, in conjunction with marketing firms Collegiate Marketing Group LLC and StudentUniverse Media, were able to partner together to bring a Guinness World Record title to the already world famous shores of Panama City Beach, Florida. Lining up on the sugar-white sands of the Gulf of Mexico, 450 women broke the Guinness World Record for the World’s Largest Bikini Parade. The event successfully shattered the previous record held by Gold Coast, Australia, where 357 women paraded last year, and also benefited local charity Beach Care Services. Registration began at 9:00 a.m. at Harpoon Harry’s Gulf front restaurant, where spring breakers and locals signed up for the parade. Participants were given official Bikini Parade hats to wear that signaled to officials which women were part of the march. The hats were in compliance with the rules of the event, which stated that bikinis of all colors and design were welcome, but tankinis, one-piece suits, shorts or cover-ups would not make the count. Additionally, event organizers provided complimentary SoBe beverages, admission to the celebration event and a memento T-shirt in appreciation of participants’ efforts to bring the record stateside. Following the one-mile march, an official Guinness World Record adjudicator announced that the record had been broken at 1:30pm. For more information on Spring Break or to book a stay in the destination, please visit www.pcbeachspringbreak.com. 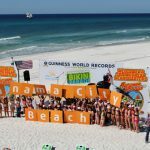 Students can also follow Panama City Beach Spring Break on Twitter @springbreakpcb to receive up-to-the minute news and details on special offers and deals. To stay up to date on CMG’s projects and opportunities, please visit their Facebook fan page at http://www.facebook.com/collegiatemarketingllc and follow them on Twitter @cmarketinggroup.